of spending the day experiencing Ghost Town Alive! 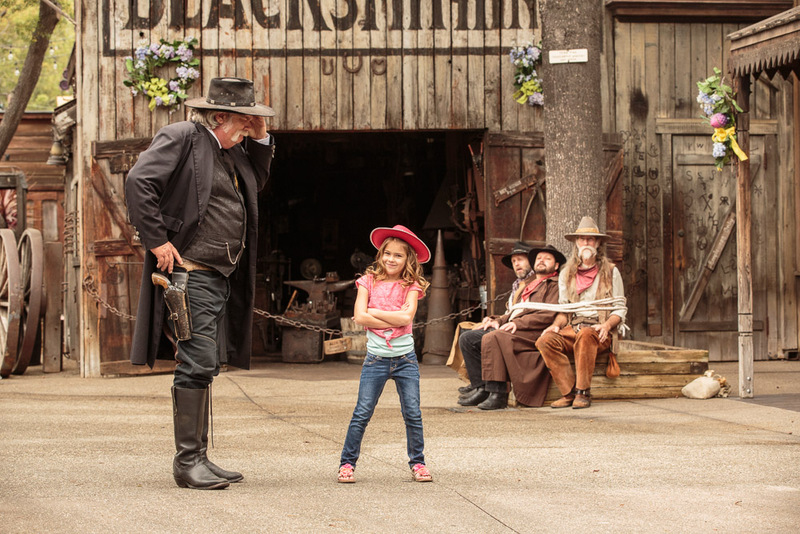 This Wild West entertainment experience engages thousands of guests per day in an interactive, role-playing attraction. Guests journey back to the 1800s to participate in a multi-threaded story taking place in real time alongside period bandits, cowboys, horses, musicians and the town mayor. Guests join costumed actors as they unfold the tale of the town of Calico in the park’s Ghost Town themed area, unlocking adventures from bank robberies and jail breaks to a good ol’ Western hoedown and more, the experience enables families to work together using their imaginations and become stars in the interactive theatrical production. The Ghost Town setting enhances the authenticity of the experience and brings the town of Calico to life through authentic buildings from Old West towns mixed in with stunning reproductions. The Old School House and Blacksmith Shop are just two examples of some the original buildings from frontier time that Walter Knott relocated to the park in the mid-1900s. Each actor is trained to naturally greet each guest passing by and bring them into the story in an organic way by catching them up on the town’s happenings. The story begins right after the notorious Mayfield Gang escapes the custody of Sheriff Wheeler, and he and the townsfolk need help capturing the bandits and keeping Calico safe. Guests can ally with the Sheriff, or join the Mayfields. Throughout the day, major events move the story-line forward. The storylines culminate in the evening with a town-wide hoedown celebration featuring all the characters. The experience is a driver of repeat visitation and incremental revenue. Guests have a reason to return again and again as the creative team creates new storylines throughout the season. Many season passholders now bring their families to the park for the sole purpose of spending the day in Ghost Town. Purchases of food and beverage have increased as well as merchandise: unique Ghost Town Alive! souvenirs and Western clothing.